The GCMSTQ8050 features a new highly efficient detector and three noise reduction technologies that enable femtogram level quantitative analysis. 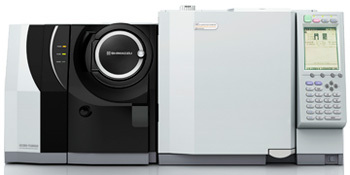 Also, the increased instrument robustness and safety provide dramatically improved reliability for ultra trace analysis. In addition to high sensitivity, the system also offers high robustness. The contaminationresistant ion source and the new detector with over five times longer service life ensure that analysis can be performed reliably for a very long time. An oilfree pump that can be operated for three years without maintenance is also available. A new turbomolecular pump with higher evacuation performance achieves a superior vacuum state in the MS unit. This improves sensitivity and stability and helps improve analysis accuracy for ultra trace concentration levels. Using the ultrafast analysis technology (UFsweeper) offered in existing models, the system can simultaneously analyze samples using multiple modes, such as highspeed scanning and scan/MRM modes. The Smart MRM technology that optimizes sensitivity helps accurately create methods for ultra trace analysis and ensures high sensitivity for MRM measurements. In addition, the enhanced accuracy control function provided by LabSolutions Insight software improves the reliability of analyzing data acquired from simultaneous multicomponent analysis of ultra trace components.